Air-to-air refueling exercises will take place over the Blake Sea refuel corridor all through the week. Preferred altitude 400 meters. Probe and drogue method using USAF KC-135 and USN KC-130 tankers for all AAR enabled squadrons. Results to be published here in future updates. Taps played at Miramar with colors at half staff on July 8, 2016. As a mark of respect for the victims of the attack on police officers perpetrated on Thursday, July 7, 2016, in Dallas, Texas, the flag of the United States shall be flown at half-staff at NAS Miramar until sunset, July 12, 2016. Lowering of the Flag at Miramar with Taps at 1700 hrs (5:00 pm SLT). Uniform - As prescribed at each station. The GT (gridtalkie) Third Fleet packs are now available from RADM Harcassle or CDR Kron. Each GT Pack has three tuners that are in fact like real life radio frequencies: A, B and C.
Tuner A is factory preset and uses the /11 prefix on local. Tuners B and C are programmable and you can assign a channel to either. In each GT Pack you will find three devices. These are a discrete ear piece type - the WIRELINK - a walkie talkie type - the MILSPEC ( NASM packs use the MARINER device ) - and a headset type - the AVIATOR. Each device and each COPY you make of a device have their own settings memorized, that means you need to configure each and each copy you may make one by one. WIRELINK - with helmets, service uniforms and any other outfits that require discrete comm links, or as an option when aboard ships for bridge officers. The Wirelink is used 80% of the time. MILSPEC / MARINER - Used in ground/SW ops, sailors in boats and ships, SEAL operations, sentry duty. AVIATOR - although named Aviator, this is a heavy duty headset device, suitable for flying propeller aircraft (i.e. C-130 or EMB-120) or transport / patrol jets (i.e. P-8). HOW TO SET UP A GT PACK. * This poses a LOT of problems with group tag dependent uniforms, like the NSTC issued NWU. You can trick your way into getting GT on with the GT group and switching to USNSL to use the uniforms but it's really glitchy and you need to always double check, reattach if you change the outfit configuration, etc. Between comms and outfits the priority is comms. That is why we don't use tag dependent uniforms at Miramar. Command will address this problem asap. RADM Isaac Harcassle or CDR Asra Sax Kron have Third Fleet pack dispensers for all three purposes. Contact one of them to get yours. Rez the Box and copy contents to inventory. ADD the GT device to your uniform, and configure it by typing /11menu in local and assigning channels to tuners B and C.
GRID ATC should be the preset for monitoring and hailing other ATC systems than 3rd Fleet's. Please select this channel on TUNER C in all USNSL 3rd Fleet GT packs. Type /11sethandle followed by a space and the handle you need. Conventionally we use RANK in Caps with no dot, FIRST NAME may be initial with dot, CALL SIGN between quotes, LAST NAME, hyphen, Role or Station in Caps. Handles are limited to 36 characters including spaces, so abbreviate first names when needed. Each device has an individual configuration, so you may create copies otr use different devices for use with different uniforms used in different missions. For instance you can set your handle on a particular device to have your ROLE rather than your STATION. Most GT problems are solved by detaching and reattaching the device. Don't panic. Also make sure you are wearing Third Fleet group. 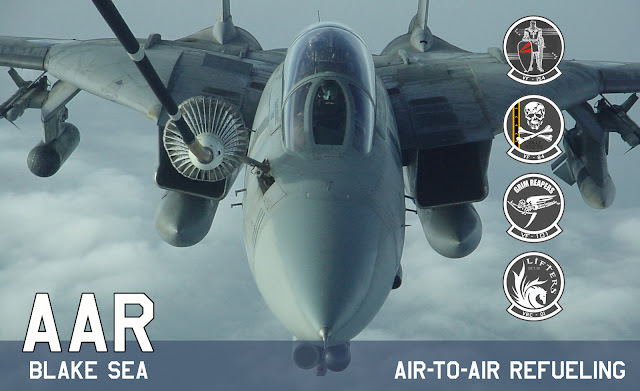 A complete Gridtalkie Class is available at NAS Miramar. Check notices for schedules. This week at Miramar we are getting our VF squadrons some much needed practice in the patrol and intercept roles. 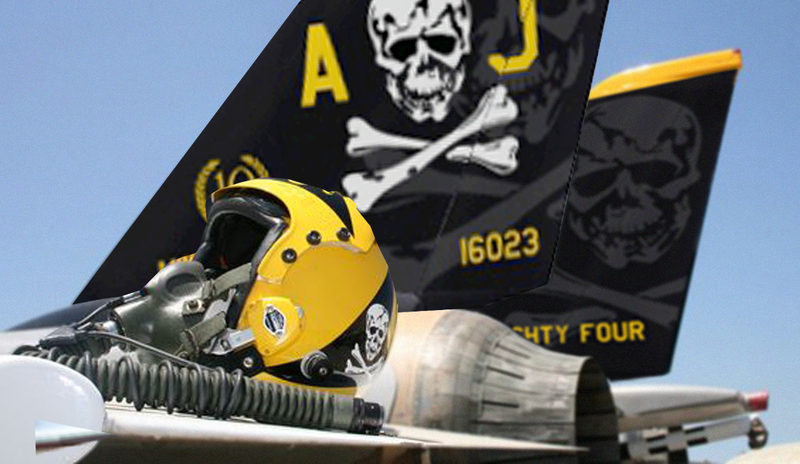 VF-84 and VF-154 will be flying pairs and trios, "cat and mouse" and navigation exercises along with Third Fleet route verification. Radar Intercept Officers will team up as needed. The Jolly Rogers will also bring the McDonnel Douglas F-4 J Phantom II's up to speed in preparation for 7th Fleet operations, together with the Black Knights Douglas TA-4 J Skyhawk's in combat configuration. A Relay For Life event, touch poster for SLUR to location. 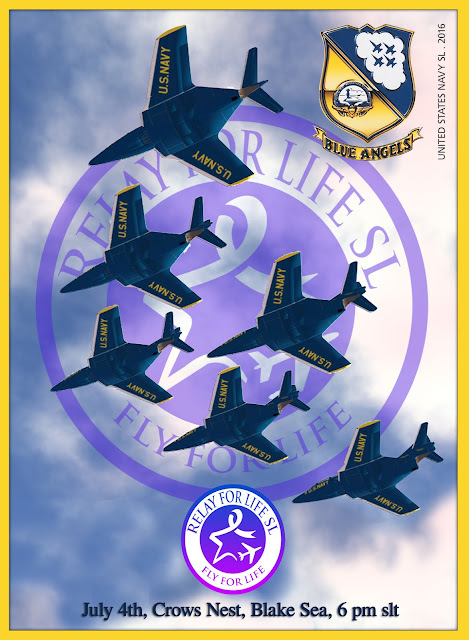 The Blue Angels will show at the FLY FOR LIFE event during the Second Life 4th of July celebrations. Together with other Flight Demonstration teams, like SL Patrouille de France, Team Phoenix and the Brazilian Smoke Squadron, the Blue Angels will be flying over the Blake Sea, North of Crows Nest. This will take place on the 4th of July, at 1800 hours SLT (6 pm). SLUR to the airshow area here or on the poster above! FLY FOR LIFE is a Relay for Life related event and we will be flying for a noble cause. Celebrating the 4th of July! Four full prim regions in the Blake Sea. Come moor your boat or land your plane and join us for a day of celebrating life and fighting back against cancer. After Day Two of the TFIA ID4 Airshow, the Blue Angels will assemble at and take off from Komatsu Air Base ( SBIA - South Blake International Airport ).